Its difficult to know who could possibly think Jones is a racist stooge - his mum? The eviction less than a month ago of the Bedouin village of Umm al-Hiran in Israel’s Negev desert should have told even the most obtuse supporter of Zionism that Israel is a settler colonial state. Yes some, a few, cities are mixed. No there is no forced segregation as in South Africa or the Deep South, but the structures of Apartheid are present in Israel. Apartheid is never more obvious than when it comes to land. When the High Court in Kadan ruled that the Jewish National Fund could not bar Israeli Palestinians from 93% of Israeli land, the then Knesset, including its Labor members, fell over themselves to enact a law which said that retaining land for Jewish use only was not discrimination. In other words it was a law which said that Black=White. The Law eventually became the Access to Communities Law. It allowed existing residents to bar those wishing to live in the area and naturally existing Jewish communities barred Arabs. People make excuses for Israel’s behaviour in the West Bank, which is under Occupation, where the settlements are Jewish only, because all the arrangements the fiction is that they are only interim ones pending a final solution and two states. But in Israel Arabs are supposed to be equal citizens yet half the villages they live in, like Umm al Hiran are ‘unrecognised’. What this means is that they are not connected to the electricity grid, they don’t have mains water or sewerage or any of the other essentials of modern life. The villagers of Umm al Hiran were moved in 1956, as a result of the Suez war and dumped where they are, or were. Some 60 years ago. But there is a plan, the Prawer Plan, whose purpose it is to displace existing Bedouin communities and concentrate them in townships. Much like South Africa under Apartheid. In their stead will come Jewish towns. In Israel, despite the ten fold increase in the Arab population since 1948, not one single Arab town has been built. Zoning and planning law are an essential accompaniment to Zionist Apartheid and they have been used to confine Israel’s Arab population into tighter and more densely packed communities. So when Israel demolished the Bedouin village of Umm al-Hiran it immediately began work on building the Jewish town of Hiran. In normal language this is called Apartheid. In order to demolish Umm al-Hiran hundreds of Israeli Border police were despatched to the village to protect the bulldozers. They came with all the paraphernalia of riot squads – tear gas, rubber bullets etc. and they immediately fired two bullets at Aymen Odeh, leader of the Arab-Jewish llist in the Knesset. They also opened fire on a car driven by an Arab resident. The result was that he lost control of the car which then ploughed into some policemen, killing one and injuring another. Netanyahu and his fascist Interior Minister Gilad Erdan promptly took up police lies and branded, without a shred of evidence, the dead Palestinian as an ISIS member. It is worth noting that unlike Palestinian demonstrations, at Jewish demonstrations such as that at the illegal Ammona settlement last week, despite throwing stones and missiles, the Police did not open fire. That is because the Israeli police never open fire on Jewish demonstrations. But they have no hesitation in attacking with gun fire Arab demonstrations. 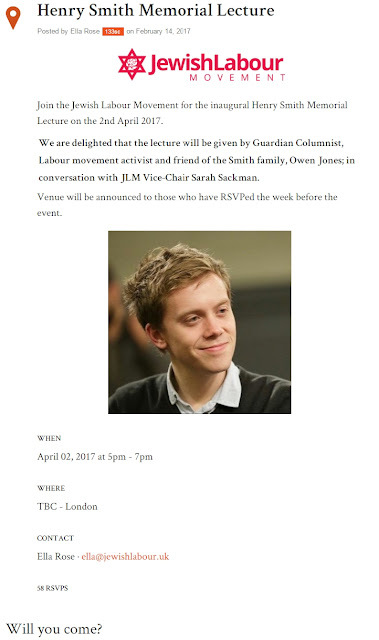 Which brings me to Owen Jones, the former socialist who it has just been announced will speak on the platform of the Jewish Labour Movement on April 2nd. 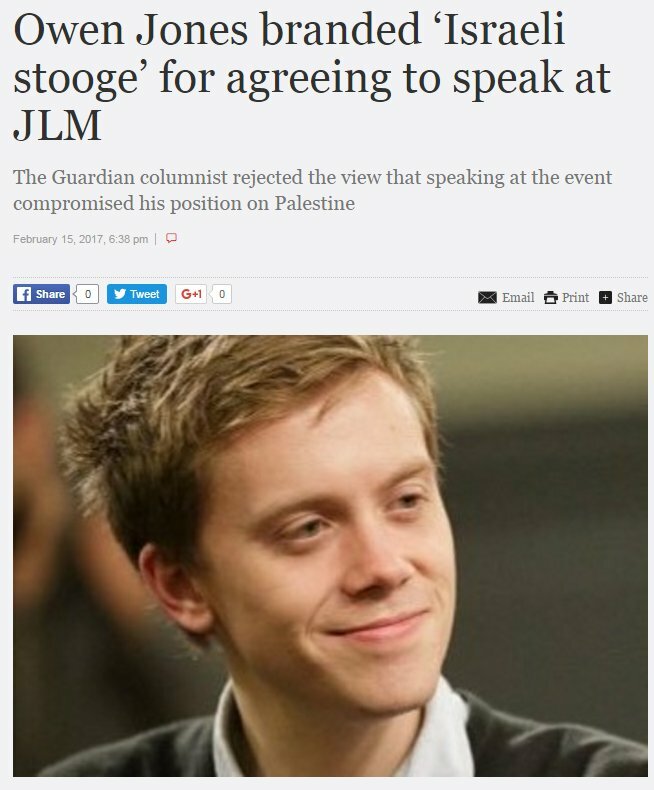 In a sympathetic article in the far-Right Jewish News, Jones whines about being ‘branded ‘an Israeli stooge’ for agreeing to speak at JLM. The JLM is the British branch of the Israeli Labour Party, which was the original party of ethnic cleansing. It is in the Knesset as the Zionist Union and has, unsurprisingly, failed to speak out against the evictions at Umm al Hiran because it itself followed a policy of Judaisation of the Galilee when they were in government. It was called the Koenig Plan at the time. 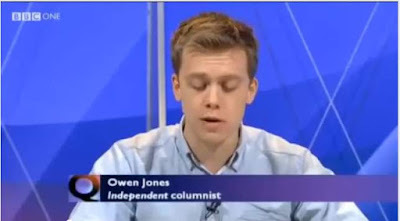 In 2012, having watched Owen Jones searing critique of Israel’s attack on Gaza on Question Time, I had no hesitation in praising the way he had spoken out in support of the Palestinians. Jones distinguished himself when the rest of the Panel, including Charles Kennedy and IDS, had trotted out the usual ‘Israel has the right to self-defence’. However Jones, like much of the Labour left, Jones has rowed back ever since. For many socialists it is a kind of ritual. You start on the Left and as your career progresses you move further and further to the Right. That was why I p predicted that Jones would follow his mentor, Nick Cohen, into becoming a sage of the Right. Jones has written 3 mundane articles on ‘anti-Semitism’ for the Guardian. [Owen Jones’ Obsession with ‘anti-Semitism’]. None of them had anything to do with anti-Semitism, but everything to do with the response of Zionism to Israel’s murderous attacks on Gaza. When defenders of Israel squealed ‘anti-Semitism’ Owen Jones was there to hawk his conscience around the columns of the Guardian and tell us how bad he felt. Today he seems incapable of even that. In August 2014 as well as Jones writing about anti-Semitism, the bogus charity, the Campaign Against Anti-Semitism was setup with the purpose of libelling the opposition to the Gaza war as ‘anti-Semitic’. It is clear now that there was a concerted campaign by the Zionist movement to tar anti-Zionism and support for the Palestinians as anti-Semitic. No group has been more assiduous in doing this than the Jewish Labour Movement and its ugly sister, the Labour Friends of Israel. He has given consistent support to Jon Lansman in Momentum writing a nasty little red-baiting article shortly before Lansman’s coup. Momentum is a beacon of hope. It must be saved from the saboteurs Jones has also made it increasingly clear that his support for Corbyn has disappeared. It was therefore no great surprise when it was announced in the Zionist press that Jones was to speak at a JLM event on April 2nd . According to the Jewish News ‘Leading Guardian columnist to speak at inaugural event in memory of Jewish Labour Movement stalwart’. It is titled the Henry Smith Memorial Lecture no less. The JLM has done its best over the past year to conflate anti-Zionism and anti-Semitism. It has proposed a rule change for the Labour Party which deprecates the ‘abusive’ use of the term ‘Zionism’. Well Zionism is what happened in Umm al-Hiran and one thing you won’t hear is the JLMM opposing what happened. Nor will you find the JLM supporting the refusenik young Israelis who refuse to serve in an army of occupation because the JLM despite its vaunted 2 states position supports the occupation of the West Bank and Gaza. For Jones to speak on a JLM platform, whatever the pretext about an old friend, is no different from a member of the Labour Party having spoken on the platform of the Apartheid State of South Africa. We should in future treat Owen Jones as he we should have done long ago – a snivelling identity politics columnist who in line with identity politics believes that Jewish identity is bound up with supporting the actions of Israel and that opposing such is ‘anti-Semitic’. In speaking on the platform of the JLM Jones should be ostracised by the Left and allowed to gravitate to his natural home on the Right. Why is Owen Jones helping to subvert Corbyn? I have never been overly sold on Owen Jones. From his platform at the Guardian, he has spent far too much time whining about Labour leader Jeremy Corbyn and his failure to reach out to voters rather than using his rare spot in the mainstream media to help him to do precisely that. But this news has knocked me sideways. It was announced yesterday that Jones is lined up to give a memorial lecture in April on behalf of the Jewish Labour Movement – the same group implicated in the recent efforts of the Israeli embassy to damage a Corbyn-led Labour party with confected allegations of anti-semitism. All of this was exposed last month in an undercover Al Jazeera investigation. The Jewish Labour Movement was effectively shown to be acting as a front for the Israeli government’s efforts to oust Corbyn over a supposed anti-semitism crisis in the party. Israel hates Corbyn because of his long-standing position in support of Palestinian rights. The announcement of Jones’ lecture was written by Ella Rose, the former Israeli embassy official who tried to conceal her past after she became the director of the Jewish Labour Movement. She was one of those caught on Al Jazeera’s hidden cameras – in her case threatening to beat up black-Jewish Labour party activist Jackie Walker, who has been the prime target of these phoney anti-semitism allegations. None of this is secret history. I first wrote about the Jewish Labour Movement’s role in trying to subvert Corbyn back in September. Mother Agnes pulled out of the rally to try to salvage it, but Jones continued to refuse to take part. I criticised Jones then over his cowardly and irresponsible behaviour. Now he needs to explain how the principles that drove him away from the Stop the War rally can allow him to support a group, the Jewish Labour Movement, that is so clearly and maliciously attempting to subvert the elected leader of the Labour party. Owen Jones has responded to this blog post both on Twitter, calling it “tedious nonsense” in his usual, dismissive style, and with a post here that tries to deflect attention from my argument with a straw man: that a conspiracy theory is painting him as a stooge of the Israeli government. No conspiracy is being posited here – only very, very poor judgment. I have also not accused him of working on behalf of the Israeli government. Only of assisting, presumably thoughtlessly, those who are working on behalf of the Israeli government inside the Jewish Labour Movement, including most definitely its current director, Ella Rose. Sadly, though predictably, he has avoided addressing the point of my criticism. It is great that he wants to pay his respects to a friend’s late father, and I am sure there are responsible ways he can do that. But one of them is certainly not by adding his name and credibility to an organisation that was recently exposed by an undercover investigation to have been acting as a front for Israeli government efforts to subvert the elected leadership of Jeremy Corbyn. The Jewish Labour Movement has been working to confect allegations of anti-semitism against other Labour party members. That is a serious form of verbal violence against members of Jones’ own party that has the power to do its victims great harm, personally and professionally. Let’s not also forget, as I pointed out, that Ella Rose, who will be hosting Owen Jones’ lecture, was filmed threatening physical violence against a fellow Labour party member, Jackie Walker. I was astounded that Jones accepted this offer from the Jewish Labour Movement. I am even more astonished that he is so casually dismissive of the very real harm caused by the actions of this organisation and its leaders.